Heat oven to 450°F (425°F for dark pans). In small bowl, mix ham, cheese, pineapple, onion and mustard; set aside. Remove crusts from pouches; unroll on work surface. From each crust, cut eight 3-inch rounds and eight 2-inch rounds, rerolling crusts if necessary. Press 3-inch rounds in bottoms and up sides of 16 ungreased miniature muffin cups so edges of crusts extend slightly over sides of cups. Spoon about 1 rounded tablespoon ham mixture into each crust-lined cup. Brush edges of crust lightly with beaten egg. Cut small vent in each 2-inch pie-crust round. Place 1 round over filling in each cup; press edges together, pushing toward cup so crust does not extend over sides. Brush top crusts with beaten egg. Sprinkle with sesame seed. Bake 10 to 14 minutes or until crust is deep golden brown. Remove from muffin cups. Let stand 5 minutes before serving. 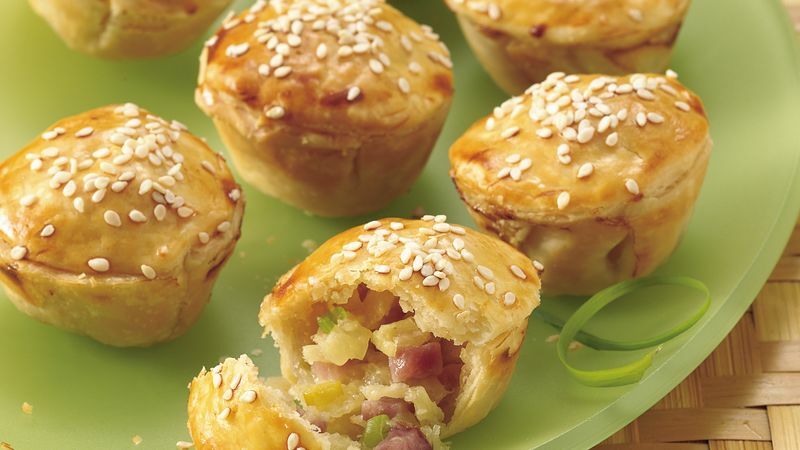 Make ahead by filling and topping the pot pies up to 2 hours before baking. Cover and refrigerate, then just before baking, brush with egg white and sprinkle with sesame seed.